Some affected residents worry for environment; others say the proposed route is the best option. Leah Hogsten | The Salt Lake Tribune Carl Ingwell with "Governor We Cannont Breathe" talks about the health impacts of an unneeded freeway. Environmental and community groups opposed to the West Davis Corridor had their say outside the Legacy Events Center as UDOT held its first public hearing on the proposed freeway, June 11, 2013. 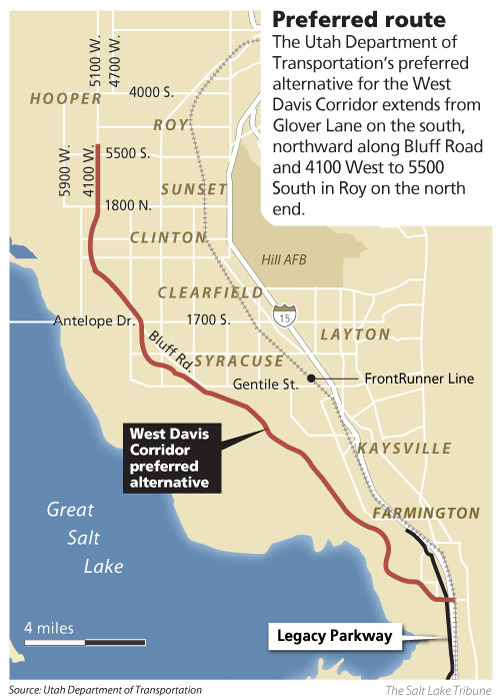 Leah Hogsten | The Salt Lake Tribune Environmental and community groups opposed to the West Davis Corridor had their say outside the Legacy Events Center as UDOT held its first public hearing on the proposed freeway, June 11, 2013. Leah Hogsten | The Salt Lake Tribune UDOT project manager Rady Jefferies takes notes as the public gives their opinions. Environmental and community groups opposed to the West Davis Corridor had their say outside the Legacy Events Center as UDOT held its first public hearing on the proposed freeway, June 11, 2013. Leah Hogsten | The Salt Lake Tribune Lisa Barkdull of Farmington rubs her face in exasperation while listening to pro-freeway supporters. Environmental and community groups opposed to the West Davis Corridor had their say outside the Legacy Events Center as UDOT held its first public hearing on the proposed freeway, June 11, 2013. Leah Hogsten | The Salt Lake Tribune Neighbors from all cities gathered around maps to discuss the proposal. 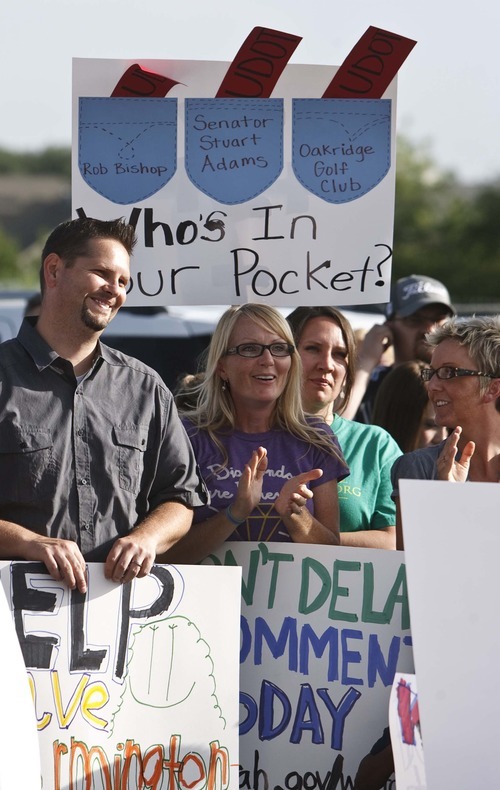 Environmental and community groups opposed to the West Davis Corridor had their say outside the Legacy Events Center as UDOT held its first public hearing on the proposed freeway, June 11, 2013. 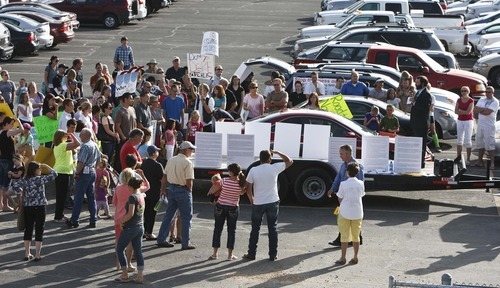 Leah Hogsten | The Salt Lake Tribune Environmental and community groups opposed to the West Davis Corridor had their say outside the Legacy Events Center as UDOT held its first public hearing on the proposed freeway, June 11, 2013. Farmington • Scores of protesters opposing the proposed West Davis Corridor freeway blasted a song Tuesday outside a public hearing to show their opinion of the road: "Highway to Hell" by AC/DC. "It&apos;s a travesty," said Heather Dove, past president of Great Salt Lake Audubon. "It will ruin wetlands and kill wildlife... The state is showing a 1960s mentality by building more freeways and creating more urban sprawl and pollution, instead of trying to get people off the road" with better transit and smarter design of communities. 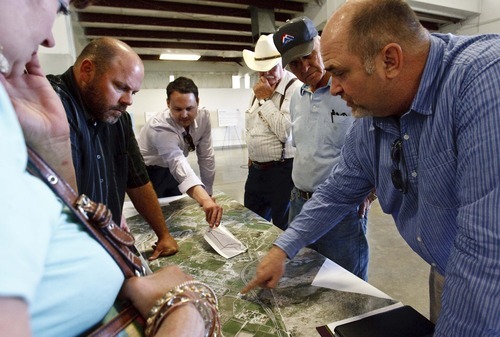 Dove&apos;s comments and the protest came at the first of three public hearings this week on the proposed freeway, which would become the northwestern extension of the Legacy Parkway through west Davis and Weber counties. The hearing, attended by several hundred residents, and protest turned into a battle between groups that would either save or lose homes under the currently proposed route  and allies for those sides such as environmental groups who oppose a freeway of any design, or people beyond the ends of the route who say it is needed to improve regional transportation. "This will destroy my entire way of life," said Jared Schetselaar, who lives near the proposed southern end of the freeway at Glover Lane in Farmington. The elevated freeway would be literally in his backyard after passing near the side of his home  but not close enough to condemn and buy it. "It would destroy the value of my home. They don&apos;t pay your for the devaluation of your property, only property they actually take," he said. "We moved there [eight years ago] to get away from traffic and have a little farm. And now we&apos;ll live by a freeway." On the other hand, scores of people who live near Shepherd Lane  which earlier had been considered as the southern end of the freeway  thanked the Utah Department of Transportation for listening to their concerns, and rejecting a interchange there in part because it will save more homes. 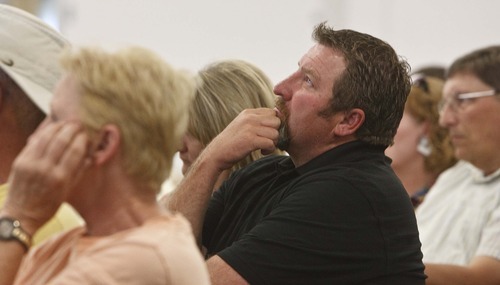 Alison Wood, of Kaysville, for example, said at the hearing, "I would like to applaud UDOT for taking the most destructive route out of consideration" at Shepherd Lane. "It is the most complicated, would require the most shifting of traffic, and takes the most houses out." 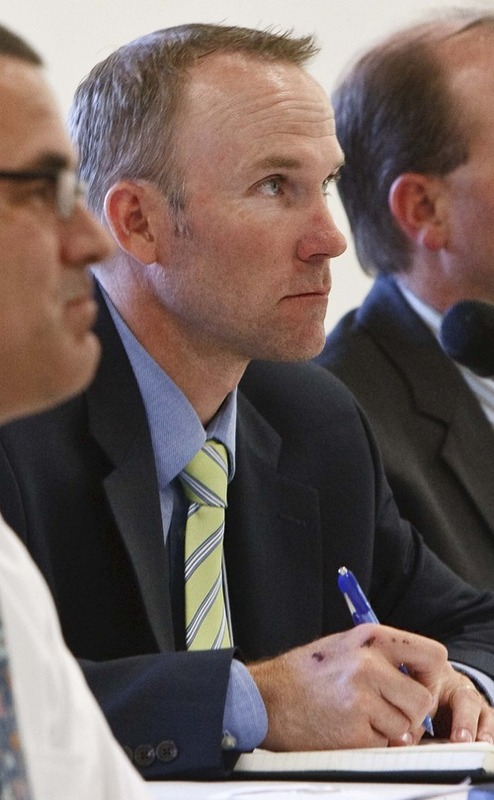 Randy Jefferies, project manager for UDOT, said the agency took three years to evaluate 46 alternatives to handle transportation in the region. "The alternative we are recommending has the best transportation performance, best interchange with I-15 and Legacy Parkway, a lower level of disturbance to residents, historic properties and farmlands and it costs less." But Lori Kalt, president of Save Farmington, said UDOT&apos;s figures show that the freeway would be lightly used for years. 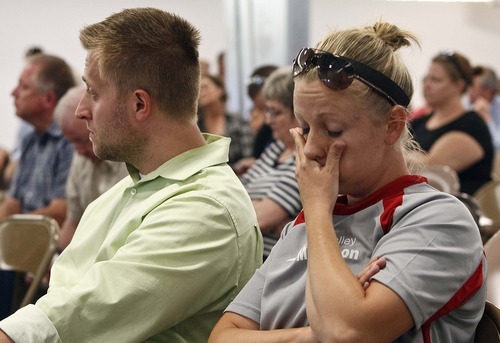 "I don&apos;t think UDOT has shown the need for a freeway." She said that with its $600 million cost, "We could subsidize FrontRunner through 2050 and make it free for everyone" and proposed serious consideration for that, saying it would cut congestion and pollution better. Brian Moench with Utah Physician for a Healthy Environment said, "Freeways create pollution. Los Angeles is the capital of freeways, and the capital of pollution. Do we want that here?" Carl Ingwell, founder of the group Governor, We Cannot Breathe, said "The governor is calling for people to drive less to reduce pollution, but UDOT is trying to get people to drive more.... This freeway will lead to stupid growth, not smart growth" by leading to more suburban sprawl. Janine Creager, of south Farmington, said people in her area will receive heavier traffic and noise, "but we get nothing for it"  not even easy access to the new freeway for the areas it passes near there. UDOT is taking comments on a draft environmental impact statement that includes its preferred route for the freeway that would be 19.7 miles long, and cost $587 million (in 2012 dollars). It would force relocating 26 homes, directly impact 52 acres of wetlands and 110 acres of prime farmland. UDOT hopes to make a final decision on routing next year, but no funding sources have been identified for the freeway. However, long range plans envision construction of the first section from Glover Lane to Antelope Drive by 2020, and completion of the rest of the freeway to Hooper by 2030. Wednesday • West Point Jr. High, 2775 W. 550 North, West Point. Thursday • Freedom Elementary, 4555 W. 5500 South, Hooper.